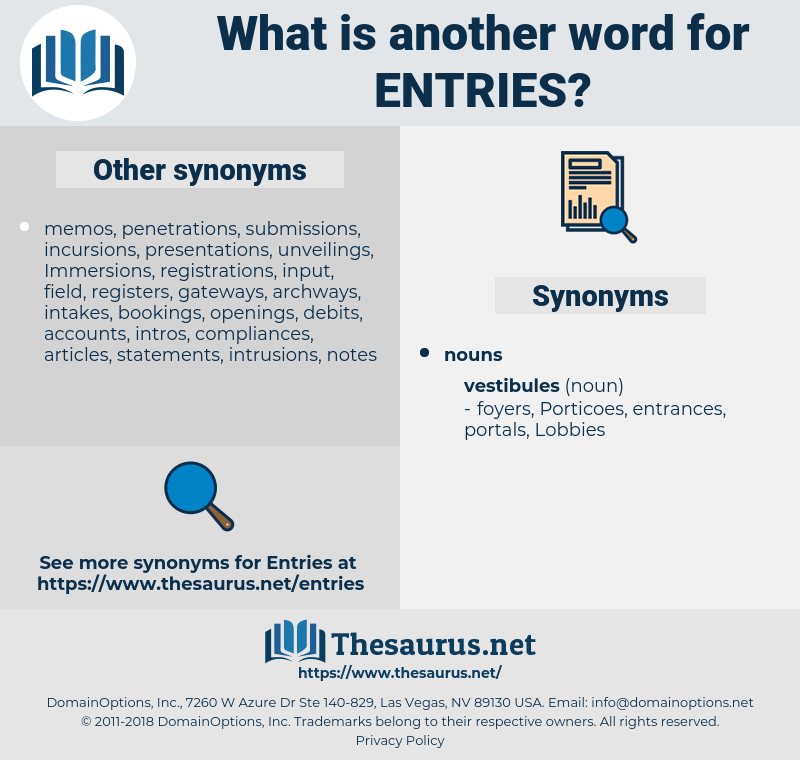 What is another word for Entries? enrolled, information, applicant, applicants, candidate, candidates, credits, response, responses, nominated, particulars, Nominating, departments, reply, Replies, execution, Answered, bidding, ledger, nominee, religious, entering, rope, bid, B, bible. participate, participations, endorsements, representations, instructions, Commentaries, enquiries, requirements, credentials, transactions, involvement, certificates, restrictions, Inventories, Directories, concurrents, descriptions, transfers, Obituaries, repositories, Classifications, crossing, crossings, appropriations, proclamations, creations, participants, identifiers, specifications, Prescriptions, ingredients, corrections, notifications, Entities, terms, Abbreviations, presentations, provisions, observations, transcriptions, statements, Remittances, restraints, immigrant, immigrants, Deliveries, tournaments, shareholdings, subscriptions, examinations, registrants, affiliations, tenders, footnotes, factors, reservations, documents, occurrences, receipts, matters, assertions, propositions, Achievements, experiments, utterances, importants, Stories, interceptions, appellations, Movements, contributions, exits, numbers, youngsters, tiers, extractives, drafts, details, contestants, initiatives, letters, designations, returns, Inquiries, passageways, settings, consignments, notes, subparagraphs, Appointments, announcements, Adjustments, interests, shipments, reports, contributors, competitions, gates, Respondents, subheadings, articles, arrivals, disclosures, elements, performances, deliberations, recruits, structures, statistics, components, additions, explanations, writings, limitations, competitors, Publications, respects, specific, Suggestions, complements, indications, directions, factsheets, comptables, names, Histories, allocations, reporters, bookkeepers, times, comments, subsections, distinctions, Undertakings, certain, expressions, chapters, championships, appetizers, banners, attendees, Incentives, winners, advisories, dossiers, excerpts, collections, segments, indents, portions, points, locations, productions, routes, Securities, Guidelines, commendations, papers, profiles, revenues, positions, imports, Referrals, Varieties, sub-headings, concepts, compositions, pointers, editions, earnings, ventures, supplements, recordals, sightings, instances, jobs, start-ups, panellists, wordings, surnames, issuances, Biographies, influxes, WEBSITES, constraints, warnings, insights, postings, Students, tokens, concours, checkboxes, writers, Databases, Posters, photographs, Pleadings, visitors, dumplings, features, folders, types, ratings, events, occasions, Births, foreclosures, prints, exports, lists, Areas, niches, parts, text, texts, imbalances, complete, eyes, specimens, checks, Languages, courses, searches, proceeds, showings, notations, subsets, titles, ranges, clusters, declared, indicators, Tailings, options, Booklets, grades, columns, stakes, Strains, novels, highlights, marks, mailings, Fees, markers, quotes, logbooks, labels, sub-paragraphs, projects, leaflets, cards, headlines, delegates, jeunes, juveniles, spots, proofs, Hires, sites, things, outlets, platters, ledgers, PORTS, pictures, electors, sets, prizes, prompts, rows, accountants, Tests, exhibits, holdings, dividends, remarks, hints, Ones, words, aspects, clauses, scripts, extract, extracts, findings, sub-items, parcels, notions, sheets, hardships, facts, scores, volumes, mail-outs, fiches, residues, subjects, noises, questions, themes, TAPES, benchmarks, lineages, nominees, fields, choices, stops, Photos, signals, amounts, values, arrays, drawings, dockets, limits, dispatch, dispatches, products, rumours, videos, venues, bullets, Incomes, packages, oeuvres, accruals, signs, accounts, bars, proposals, songs, data, Schedules, Copies, guides, abstracts, displays, young, raids, Cells, rolls, hits, Equities, lignes, deeds, Videotapes, INS, messages, Indices, artists, squares, flows, speeches, designs, paragraphs, runs, pieces, samples, transcripts, acts, objects, lots, artworks, topics, wastes, Rewards, Benches, youth, Youths, residuals, rivals, lifts, leads, batches, opinions, tips, symbols, meals, awards, gaze, Voices, trials, bids, blocks, spaces, saddles, games, NOMS, enrolled, shares, Forms, outputs, cases, plans, shafts, swaps, kids, assays, Motions, books, Los, Films, offices, sums, funds, Boxes, groups, huts, dots, Cues, push, heads, Foods, plugs, works, claims, figures, Clips, matches, dishes, Having, passes, ADS, nouns, dashes, MOVIES, applicants, candidates, credits, LINEs, responses, particulars, goods, units, submissions, Replies, Cas, answers. provides, feeds, emerges, searches, flows. candidature, candidatures, markings, nominate, nomination, nominations, submissions, candidacy, bookings, scripture, answer, answers, phrases, input, inputs, registration, registrations, enrollment. 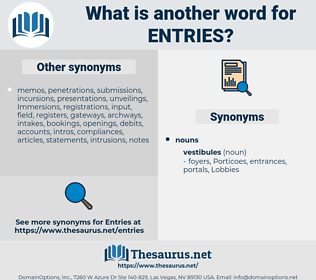 enter, entrants, enrollments, enrolments, entrees, introductions, importations, admissions, accessions, accomplishments, declarations, memberships, gateways, pronouncements, departures, adherences, driveways, contests, marking, passages, intakes, annotations, candidacies, comings, intimates, Adhesions, Scriptures, paintings, Essays, rubrics, candidatures, markings, nominations, phrases, inputs. We get it in entries which begin late in the year, and, I think, were posted up all together after the final incident; but they cover so few days in all that there is no need to doubt that the writer could remember the course of things accurately. It is told of one of the early circuit riders among the New England ministry, that he made the following entries in his diary, thus well illustrating the point: Wed.